Proving that it takes a village to raise a barn, nearly 200 local dignitaries, business people, politicians and horsemen stood on the hallowed ground of Goshen Historic Track to witness the groundbreaking of the new building project on Tuesday. 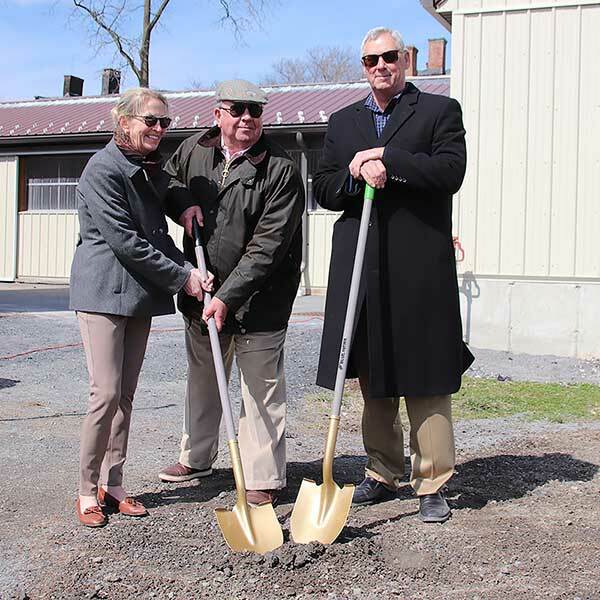 Janet Terhune, Larry DeVan & Steve Jones break ground at Goshen Historic Track for a collaborative building project with the Harness Racing Museum (Chris Tully photo). Known throughout the land as the World’s Oldest Harness Track, the National Historic Landmark survived a devastating fire in August 2017 to emerge with plans to overcome adversity and erect a new structure in conjunction with the neighboring Harness Racing Museum & Hall of Fame. The idea of pooling resources was recognized as a solution one of the Hall of Fame’s biggest challenges: Where to store the enormous quantity of items and artifacts that continues to be donated to the Museum. The intention is to utilize the soon-to-be-constructed historic replica “barn” that occupies land on the grounds of Goshen Historic Track. Also on hand to speak to the importance of the project were Harry Porr, Deputy Orange County Executive; Doug Bloomfield, Town of Goshen Supervisor; Mike Nuzzolese and Kyle Roddy, current and former Mayors of the Village of Goshen; Ted Lewis, Goshen Building Inspector; and Barbara Martinez, Executive Director of the Goshen Chamber of Commerce. Although each speaker brought their own unique perspective to the project, one consistent theme was prevalent: the significance of harness racing to Goshen and the assistance needed to realize this vital rebuilding endeavor. GOSHEN — Ray Schnittker had a track record weekend with his horses at Goshen Historic Track. The great trotting mare Check Me Out only has two foals of racing age, and both are track record holders at the track that their mom called home. Check Me Out raced to fame and fortune in 2011 and 2012 for Ray Schnittker and her first two foals — Mooska Stride — 3,1:56h at Goshen Historic Track (GHT) on Sunday, July 1 and Check Out Trixie — 2,1:58.4h at Goshen on Friday, June 29 were both Track Record performances. Through three days of racing at Goshen Historic Track, Cameo Hills Farm in Montgomery, which produced all three of these fillies, has bred the winners of six races at GHT — Check Out Trixie, Major Sugar Rush, Hickfromfrenchlick, Damion Diesel Hahn, Mooska Stride and Youcouldbethatgirl. The first four are trained by Ray Schnittker while Mark Harder trains Mooska Stride and Dan Daley conditions Youcouldbethatgirl. On the sweltering Saturday afternoon of June 30 in Trot-Town USA with the temperature hovering in the mid-90’s two Billings divisions went to post over Goshen’s Historic Track and when they were declared official Steve You’re Never Too Oldford and Smokin’ Joe Faraldo each emerged victorious in their respective divisions. Oldford winning with Starsaboveallerage in 1:58 while Faraldo scored behind Tough Get Going in 2 flat. And although each contest had short fields action was intensified when each winner scored a tight nose decision. In Oldford’s contest he sent his trotter to the lead from the two-hole and they carved out fractions of :29.2; :59 and 1:28.2 with “Joltin’ Joe” Pennacchio and Cheeky Little Minx shadowing the leader’s every move. However, when Starsaboveallerage rounded the final turn and headed for home he was quickly joined by Cheeky Little Minx and the two trotters raced for the wire head-to-head and nose to nose and when the photo was deciphered Oldford’s trotter was a nose better that Pennacchio’s. Third place some 4-1/2 lengths behind the top two was Connie Keeper, driven by Scott “the driving doctor” Woogen. Oldford Racing owns the winner who is trained by Allen Sisco. In his division, Faraldo gunned Tough Get Going to the lead when the wings of the mobile gate folded but yielded command to Winwood Scout and driver David “Poppa” Glasser before the quarter which was clocked in :28.2. Like the previous Billings event, it was a two-horse charge to the wire and so close a photo was needed to declare a winner. Gianni was a nose back at the wire and Winwood Scout faded and finished third. Faraldo co-owns the winner with trainer Richie Banca. And for “Joltin’ Joe” it was his first winner on American soil this year after having had two victories in France earlier this season. June 10th Matinee “Baby” Races a Hit With Seniors! 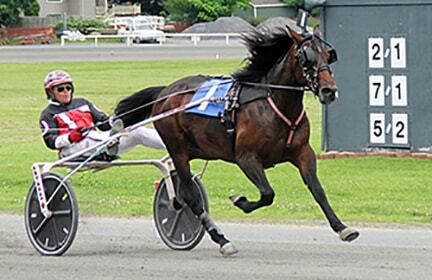 In other “baby” races (2 year olds), Joseph Chindano, Sr., sent his two Heston Blue Chip colts to the gate, Send a Note and Hot Seat, in a competition that saw Send A Note, reined by Joseph Chindano, Sr., victorious. In a wire to wire victory, Send A Note was challenged during the last quarter when Jordon Stratton pulled Rock America, but was unable to catch him. 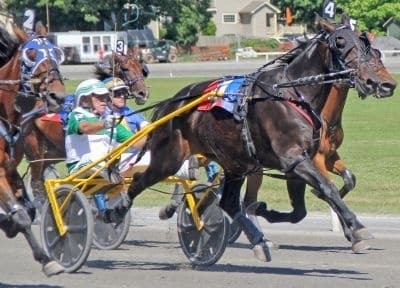 In another two year old competition, Jordan Stratton reined pacer Hurrikane Norakane to a 2:03.1 victory following a 2:07.4 second place finish last week. Joseph Chindano, Sr. marked a second victory with his Roll With Joe filly, Qing Qong Blue Chip driven by Michael Petrelli. And in the open competition, cheers and congratulations to Marianna Monaco who enjoyed her first driving win behind veteran 9 year old trotter, Baltimore As. 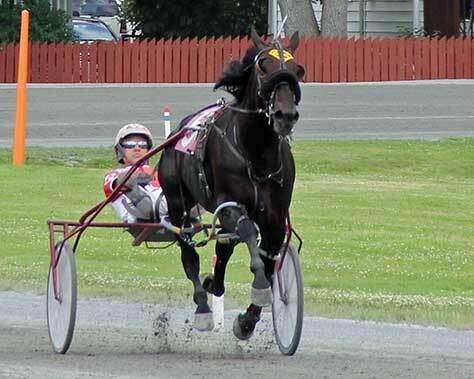 Cathy Gearwar of Benson, Vermont rode her 5 year old Armbro Hall to a 2:06.1 under saddle victory. Armbro Hall is trained by Peter Gearwar and owned by Cathy and Peter Gearwar. Dubbed “Senior Day”, there were gift bags, giveways, 50’s music, and cheers for the babies who might one day make harness racing history. Matinees continue on June 17. Grand Circuit Racing on June 29 and 30, and July 1 and 2. Post time at 1:00 P.M. 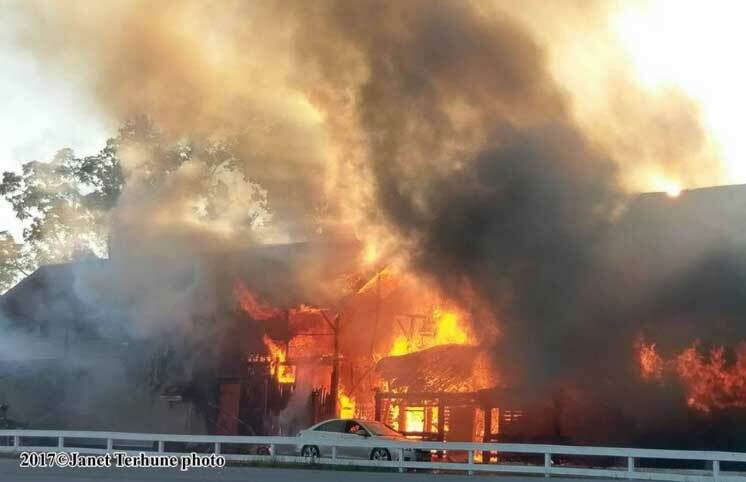 The Chutzpah Kid, owned by Alan Schwarz, trained and driven by Chuck Connor, Jr.
By now you are probably familiar with the details of the devastating barn fire at Goshen Historic Track last Wednesday evening (8.23.17). The fire started around 6:00 pm and spread ferociously. We are very grateful that there was no loss of life and that more than 30 horses were rescued from their burning stalls. For this we must thank the quick thinking and responses of good Samaritans, trainers, Track staff and firefighters. The following day, work crews were able to salvage some mementos from the historic stables and blacksmith shop. “It’s a little early to tell what our exact plans are,” said Steve Jones, the Historic Track board president. “But we’ve been here since 1838 … We’re going to pick ourselves up.” More than anything, it is important to keep our national historic landmark a vital part of harness racing history. 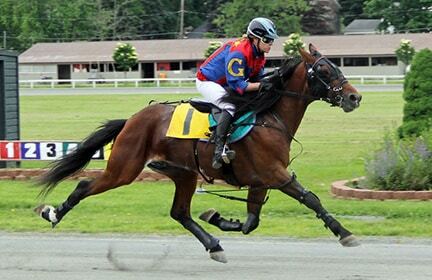 It is still the area’s premier location for boarding, training and racing Standardbreds. Now, more than ever, we need your support. We will be entering our 108th season of harness racing in 2018. Goshen Historic Track is the oldest active harness racing track in the world. 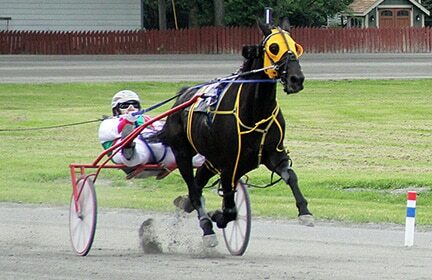 Please help us keep the tradition of harness racing alive. A donation of any amount would be greatly appreciated. Thank You! With a donation of any amount. We need to rebuild. We wrapped up our 2017 racing season Tuesday afternoon, July 4th, with a 10-race card. 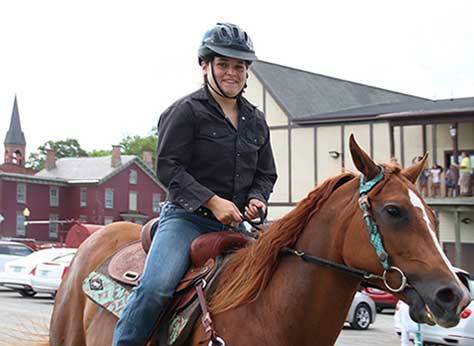 For those who attended the races any of the 4 days they had the privilege of seeing Kaitlin Jones lead the parade of horses each race with her trusty quarter horse Snoopy. It was the first time she had been a parade Marshall. Kaitlin’s ability to bring the horses on the track in order and her outstanding horse handling skills in case of trouble made the races run smooth as silk. 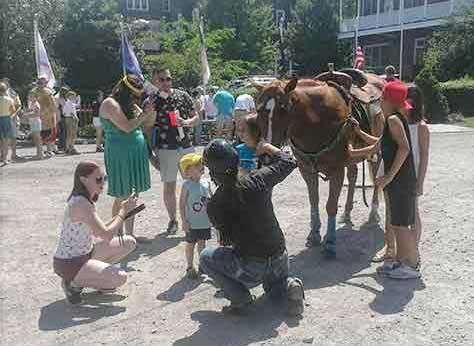 If that wasn’t enough, the biggest hit was Kaitlin and Snoopy interacting with all the visitors at the track. From kids in strollers to grandparents, everyone wanted to pet or take pictures with Snoopy and Kaitlin. Racing and track officials were absolutely delighted with all Kaitlin did for the racing and the promotion of the track. Presiding judge Ozzie Cole felt “that girl looked like a seasoned pro out there. The fans loved her.” Goshen is great racing and behind the scenes there’s always people like Kaitlin Jones making it run smooth and making fans smile. 7/2/17 – Jason Bartlett also drove three year old pacing colt, Outkast Blue Chip to a 1:54.3 victory for owner Blue Chip Bloodstock Inc, trainer, G. Buzzy Sholty. The Landmark Stakes today, 7/3/17, at Goshen Historic Track were highlighted by three wins on the program for trainer/driver Ray Schnittker , and an impressive showing by the first crop of pacing stallion, So Surreal. The Landmark Stakes for 2 year old pacing colts went to Real Ravenbow , wire to wire in 1:57.4 , he is a 2 year old So Surreal colt trained and owned by Janice Connor, Arden Homestead Stable and Crawford Farms Racing. Damion Diesel Hahn, another colt by So Surreal was 2nd in the Landmark Stake, and Thrill of the Chase, yet another So Surreal was fourth. Keystone Velocity Sets New Track Record! Our second Matinee Race of the season was on a beautiful day. Among the winners was Keystone Velocity in the seventh race. 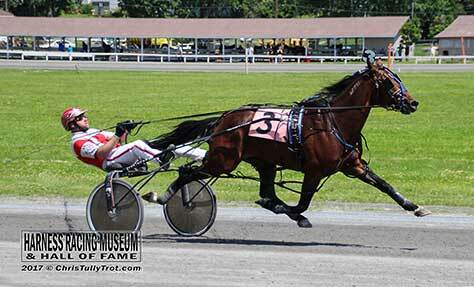 Congratulations to driver Brandon Simpson and trainer Rene Allard for their historic win! Schedule a Spa session now! 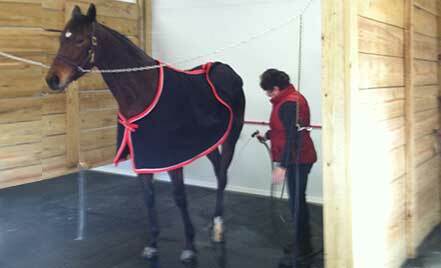 The Goshen Equine Spa is available to all types of horses. Call 845-294-5333 to make an appointment. 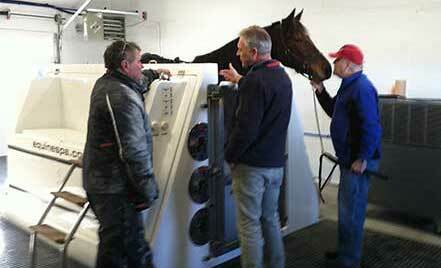 We are proud to announce that a Cold Saltwater Hydrotherapy Spa is now a new feature at Goshen Historic Track. The spa is used to treat and prevent a multitude of injuries. At 35°F / 2°C saltwater temperatures, the spa can address virtually all lower leg injuries. The treatment temperature alone induces a massive rush of blood and enhanced circulation which otherwise would not be present. Drug-free, the spa therapy can be used to increase mobility and reduce swelling in the limbs before and after competitive events and training. It is ideal for injury prevention. Read about our Boarding and Training Facilities. Help us keep trotting and pacing! For as little as $35 annually, you can participate in history in the making. We have Patron and Corporate memberships as well. Goshen Historic Track is a non-profit 501C3. Also, an anonymous benefactor will match your gift for any amount above your donation! Help keep us trotting and pacing for years to come!